The stately 1912 Columbus W. Deen house sits at the epicenter of the Lake Morton Historic District, meticulously restored to its original majesty. Although this classic 1908 bungalow has architectural features that ennoble it, its owner has a simpler explanation for its quality: it functions beautifully as a home. Purcell and ElmslieÕs Prairie School masterpieceÑan enduring, resilient public workplaceÑis also an astonishing work of art. Through the years-long process of finding, then renovating, the old house on Tillamook Street, the Rosenblums developed deep bonds with the house and deeper ones between themselves. A 1940s kitchen in a 1911 bungalow? No: Time for the house to act its age. 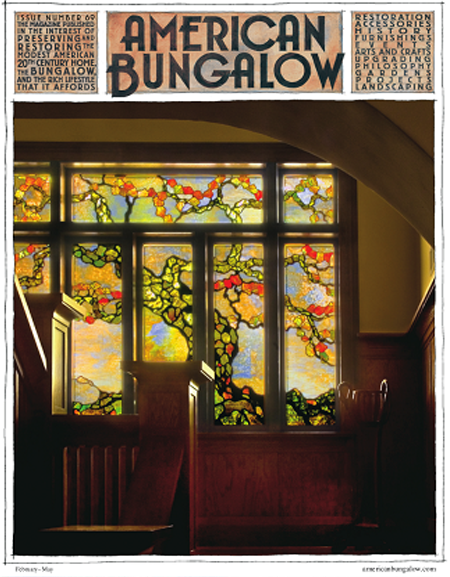 An American Bungalow house plaque becomes a poignant reminder of loss; readers salute the Winter Issue; and the owner of a Pittsburgh garlow has a question. A selection of Arts and CraftsÐinspired amenities for contemporary living. Gary Knapp, the Cats Eye Craftsman clockmaker, pondered serious woodcrafting for 30 years before jumping in with a splash five years ago. Stepping into its third decade, AB News makes the move to the Web and into your Inbox.